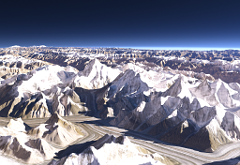 Depictions of the Earth – 3D views, panoramas, satellite images and classical maps – this and more is offered by the Imagico.de Geovisualization services and products. For anywhere on the planet – my aim is producing descriptive, informative, accurate and appealing illustrations of geographic contexts in the best possible quality. You would like to use one of my images? For example in a book or on a website? Here you can find a catalog of views that are available for such applications. If you see an image suited for your purposes you can start a license inquiry. If you only need few prints of images you can order them here as well. You require a special view – of a certain place from a specific perspective or with additional markings and labels? Here I have made available some useful information concerning the production of custom views and you have the possibility to make a production inquiry. If you produce your own illustrations you can here find various geodata products processed for visualization purposes. Sources for these are mostly satellite images and data from OpenStreetMap. Using processing techniques I developed this data is generalized and assembled into data sets ready for designing high quality maps and images.